What color is black? Is it one color or many colors combined to “look black”? Black is the absence of all reflective colors, and when the three primary colors (red, yellow, and blue) are combined in just the right way, they give off the appearance of black. 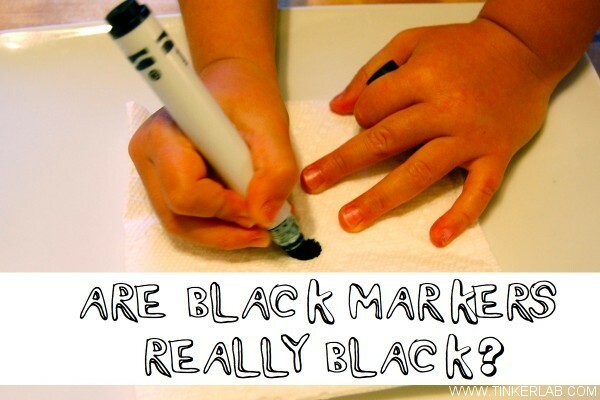 We set off to find out more about the predominant colors in our black Crayola marker, and to do this we had to separate the colors. The chemical technique used to separate dyes, pigments, or colored chemicals is known as chromatography. 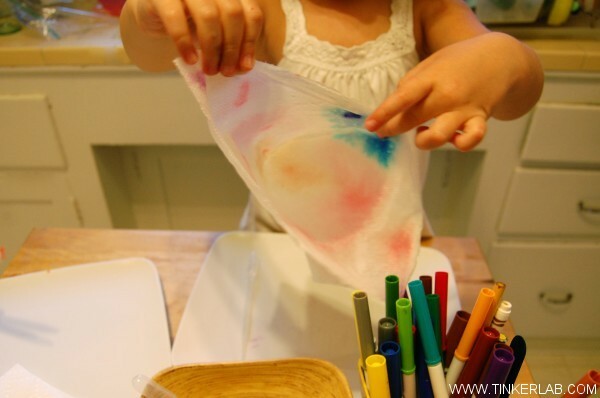 This activity can take anywhere from 5 minutes to 25 minutes, depending on how much experimenting your child wants to do, and it’s appropriate for kids ages 2 and up. It’s so simple to do, and would be a natural addition to a morning or afternoon of drawing with markers. 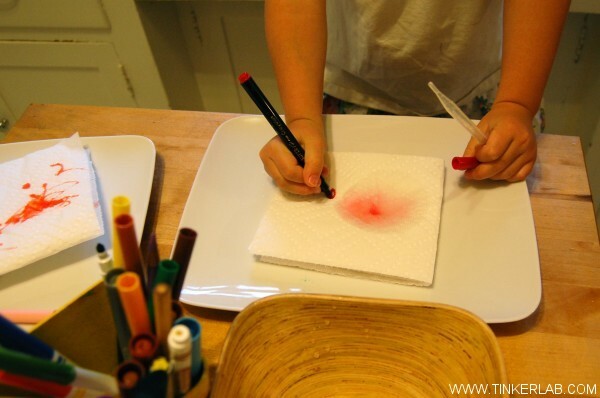 We started by drawing a big quarter-sized dot on the paper towel, and then squeezed water on top of it. The colors that are released into the paper towel give you some clues as to what goes in to your black. In our case, there was a lot of green. 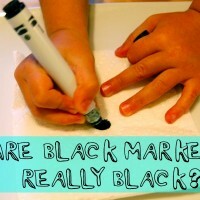 After the black marker test, 3-year old N wanted to test the rest of her markers. She made a lot of predictions, and they all came out as expected (yellow appeared to be yellow and green was made from green dyes). The red and pink, however, stumped her as they both released a pink color. And then there was a lot of fun in opening the paper towels up to reveal the levels of color that soaked through all the layers. For older kids, this slightly more advanced version of our kitchen experiment from Science Project Lab has some pretty cool results. 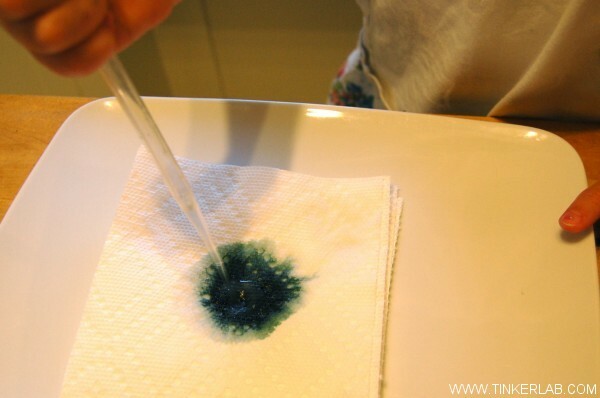 Kids will be amazed at the rainbow of colors released by leaves in this chromatography experiment shared over on TLC Family. 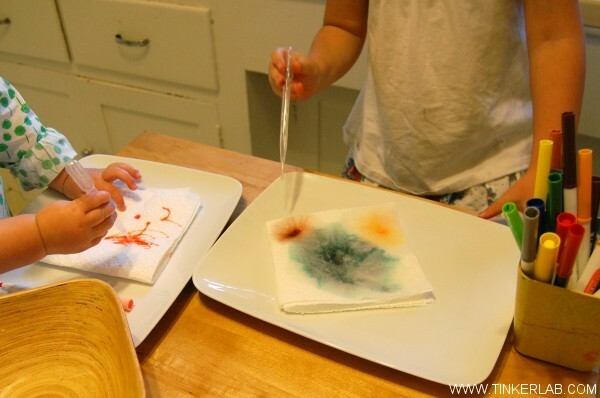 I like this coffee filter chromatography project from Kids Make Things. Have you tried this experiment with your kids? Do you have a favorite paper towel/coffee filter project? What is the most challenging part of doing experiments with your kids?